I thought we’d do something different today to stretch your minds. Can you find 24 books of the bible in the paragraph below? Some of the book names will be obvious, but others may link between words or across punctuation (e.g. … banjos. Huaraches…= banJOS HUA). Have fun and let me know how you did! 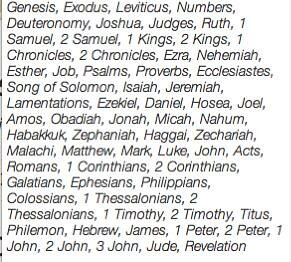 Can you find the names of 24 books of the Bible in this paragraph? This is a most remarkable puzzle. Someone found it in the seat pocket on a flight from Los Angeles to Honolulu, keeping himself occupied for hours. One man from Illinois worked on this while fishing from his boat. Roy Clark studied it while playing his banjo. Elaine Victs mentioned it in her column once. One woman judges the job to be so involving, she brews a cup of tea to help calm her nerves. There will be some names that are really easy to spot…that’s a fact. Some people will soon find themselves in a jam, especially since the book names are not necessarily capitalized. The truth is, from answers we get, we are forced to admit it usually takes a minister or scholar to see some of them at the worst. Something in our genes is responsible for the difficulty we have. Those able to find all of them will hear great lamentations from those who have to be shown. One revelation may help, books like Timothy and Samuel may occur without their numbers. And punctuation or spaces in the middle are normal. A chipper attitude will help you compete. Remember, there are 24 books of the Bible lurking somewhere in this paragraph.